Upward Bound for the Summer! 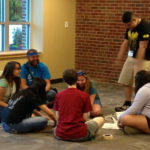 With science experiments during the day and improv at night, our Upward Bound East and Central students got an unforgettable taste of college life at St. Norbert College this June! 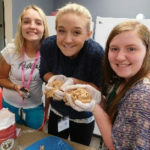 Students spent two weeks in the residence halls, making friends quickly while doing everything from extracting DNA and making ice cream to doing community service projects. Every moment was filled with something new. To spark their creativity, students signed up for UB Clubs, choosing between topics like visual art, writing, cooking, and the book club. 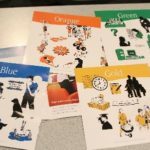 A psychology experiment helped students learn about their personalities, and they had fun making posters to represent their values. 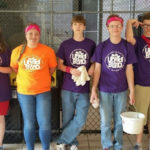 They were encouraged to work as a team on art projects, a ropes course in leadership, and athletic challenges ranging from kickball to zombie tag. An admissions presenter engaged with the students to answer their questions about college life and academics. They even got to learn about gardening while pulling weeds and watering the plants at the college’s community garden. Ready for anything, students still had enough energy to run the Fox River trail at 6 each morning and take a guided tour of the campus during the day. Learning how to balancing work and play was a key part of the trip. 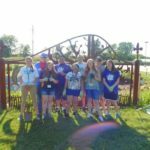 When they were not learning physics or horticulture, students enjoyed giving back to their communities with a trip to the NEW Zoo and making dog and cat toys for the Humane Society. 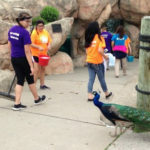 They explored the zoo after cleaning up after the animals and guests, helping out with office work, and visiting with a few animals during a presentation about zoology. Students went home with great stories to tell their families and friends, their minds buzzing, and ready for the adventures that lie ahead. 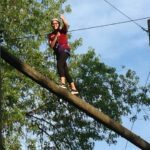 Students took part in a ropes course on leadership. No fear of heights here! Improv nights were fun for everyone. Students enjoyed each other’s company with games like MadLib, art projects, meditation, and even cooking. The peacocks at the NEW Zoo got up close and personal with the class. The giraffe cages don’t clean themselves! That’s what these great guys were there for. Students took an assessment to find out their personality types. They were then sorted into groups to make posters showing their values. Dogs and cats at the Humane Society thank these ladies from the bottom of their stomachs. 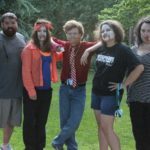 UB staff dressed in zombie costumes while students tossed marshmallows at each other in a friendly game of zombie tag. If you look closely, you can see the green thumbs on the students who helped out at St. Norbert’s community garden.